If you're struggling with debt and don't see a light at the end of the tunnel, working with a credit counselor may be your best move. Credit counselors are trained to help you manage your debt and understand credit, cash flow, and budgeting. They will take a holistic look at your financial situation, then help you craft a plan to get out of debt and handle your money problems once and for all. While this may sound like exactly what you need, it's important to note that all credit counselors are not created equal. The Federal Trade Commission (FTC) says that most reputable credit counselors work for nonprofit firms. But it warns that "nonprofit" status doesn't guarantee that their services are "free, affordable, or even legitimate." Some credit counseling organizations are known for charging high fees, which they try to hide with layers of complexity. The FTC also notes that credit counselors sometimes ask for voluntary contributions to their business, even if making those contributions would put you into more debt. Obviously, you'll want to avoid credit counselors with high fees or shady practices. Before you choose a credit counselor, approach the situation with a list of questions to ask right away. 1. Is this a nonprofit credit counseling agency? 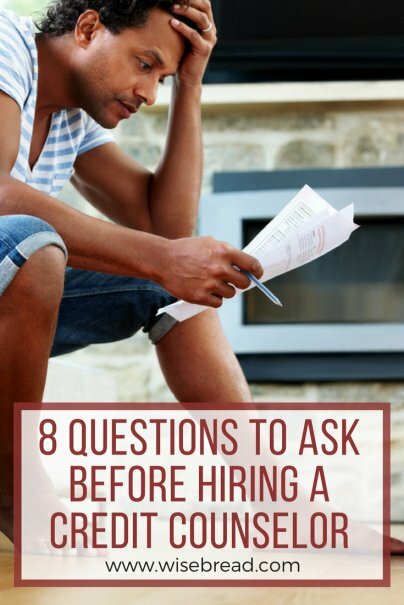 While this may seem like an obvious question, credit counselor Joseph Martin of Take Charge America, a national nonprofit credit counseling agency, says this question is crucial to ask right away. Because there are many different types of debt relief organizations with similar names and very different services, you should make sure you're speaking to a credit counselor instead of a different type of business, he says. If you think you're speaking with a credit counselor but are instead speaking with a debt settlement company, for example, you could wind up receiving advice that doesn't help you reach your goals. Credit counselors offer budgeting and financial education services. They can also help you create a plan to get out of debt by paying off your debts, often at reduced interest rates, through a long-term debt management plan (DMP). Doing so will eventually help to rebuild your credit. Even though "nonprofit" credit counselors can charge hidden fees, you'll still want to know if you're working with a nonprofit organization, says Martin. Why? "The initial financial assessment, budget, and education are always free with a nonprofit," he says. A smart way to weed out unethical or substandard credit counselors is to find out if the credit counseling agency belongs to the National Foundation for Credit Counseling (NFCC) or the Financial Counseling Association of America (FCAA). Members of these industry associations must be accredited by the Council on Accreditation and must "abide by specific guidelines, ensuring consumers receive a full, comprehensive guided session to identify individualized debt and budgeting solutions," says Martin. By choosing a credit counselor that is accredited, you'll be choosing the cream of the crop. 3. How much do your services cost? If you're talking to an accredited nonprofit credit counseling organization, services like budgeting and receiving general financial advice should always be free. Your antenna should go up if a credit counselor wants you to pay anything for those services. "If an organization won't help you because you can't afford to pay, look elsewhere for help," the FTC writes on its website. Entering a debt management plan will usually cost more. According to CreditCards.com, most counseling agencies collect monthly fees from people who enter DMPs — up to $50 a month. A DMP usually lasts three to five years, so that means you could end up paying as much as $1,800 to the credit counselor. In addition to asking what recurring fees the agency charges, you should also ask whether there is an initial setup or consulting fee, says licensed insolvency trustee Michael Krieger of Krieger & Company in Toronto, Canada. If your credit counselor glosses over the topic of how they get paid, definitely dig deeper, says Krieger. Or just move on and find someone else to work with. Here's another common sense question that should be asked right away. Before you decide to work with a credit counselor, make sure you know what services they offer and if they're services you actually want. The FTC says you should look for an organization that offers several different services "including budget counseling, and savings and debt management classes." The FTC also says you should avoid organizations that only offer a debt management plan (DMP) or push a DMP without fully analyzing your situation. "Individuals very quickly head down the wrong path from counselors and financial service providers without really looking at the value they are adding," says Krieger. "Those making promises that seem too good to be true usually are, yet people latch onto those promises." 5. What is your monthly DMP dropout rate? If you do decide to enter a DMP, go into it knowing that only about 25 percent of debtors complete their plans with a credit counselor, according to CreditCards.com. Another 25 percent report that they finish paying off their debts on their own. But that's hard to verify. So the question to ask a counselor whose advising a DMP is how many people drop out of the plans every month — 2 percent is low, 5 percent is high. 6. How will we meet? Before you connect with a credit counselor, it's important to know exactly what you're getting into. Will you talk to them online using technology like Skype or Google Hangouts? Will you talk on the phone? Or will you meet in-person to go over your budget and financial situation? If you believe meeting someone in-person would be the most helpful, then you should seek out local credit counselors that offer this option. If not, Krieger says you should decide if you're OK working via the internet or phone where your service may feel less personal overall. 7. Can I get my family involved? Whether you're receiving credit counseling in-person or over the phone, Krieger says it should be a family affair. This means that, ideally, you'll be able to sit down with your credit counselor and your spouse or partner to go over the family's finances and debts and how everyone can be involved in the solution. 8. How will working with you help me in the long run? The FTC says that you should ask any credit counselor you're thinking of working with how their advice will help you in the future. After all, you don't just want to get out of debt — you want to stay out of debt. By asking your counselor about their methods, you may gain some insight into how they can prepare you for a financial future free from the debt and financial strain you're experiencing today.